Experience a Camp Bethel evening TOGETHER! Join us for 5:30 dinner and singing in the Ark Dining Hall followed by fun camp activities and topped off with a campfire and S’mores. Fee includes dinner, activity leadership & supplies & S’mores! Nature Fun + Game, ages 4 & up w/ parent - $10/person. July 9 = Dinner + Nature Fun & Games & S'mores. July 16 = Dinner + Nature Fun & Games & S’mores. ​July 23 = Dinner + Nature Fun & Games & S’mores. Please notify the camp office 540-992-2940 or CampBethelOffice@gmail.com in advance if you will not attend this session. Late arrival and early departure is discouraged, but allowed in case of illness, family emergency or conditions beyond control. 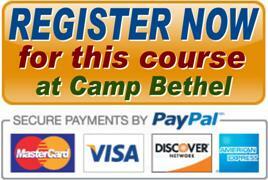 (1) Your fee is non-refundable unless Camp Bethel cancels the camp program. (2) If complete payment of the camp fee (or scholarship approval or Good-As-Gold form) is not received 5 days prior to your camp date you will forfeit your reserved spot. (3) There are no refunds for cancellation of reserved spot in camp within 5 days prior to your camp date. (4) There are no refunds for partial camp attendance or early departure for any reason unless Camp Bethel cancels the camp program.